Perennials and Places-- How well do you know your perennials and geography? This quiz hotlinks you around the world of perennials. 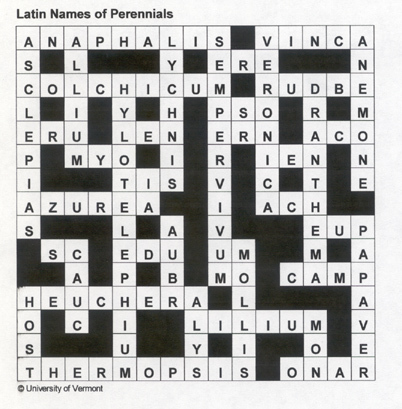 Perennials and Persons-- Do you know who discovered specific plants or lent their names? Perennials and States-- Check your knowledge of geography, learn some places to visit. Who said that?-- Try and match the quotes with the authors. Fill in the blanks for the words called for, then submit to see what story you've just completed. These are always humorous, and if you haven't done one before you may be in for a surprise! These puzzles can be played easily by several methods. 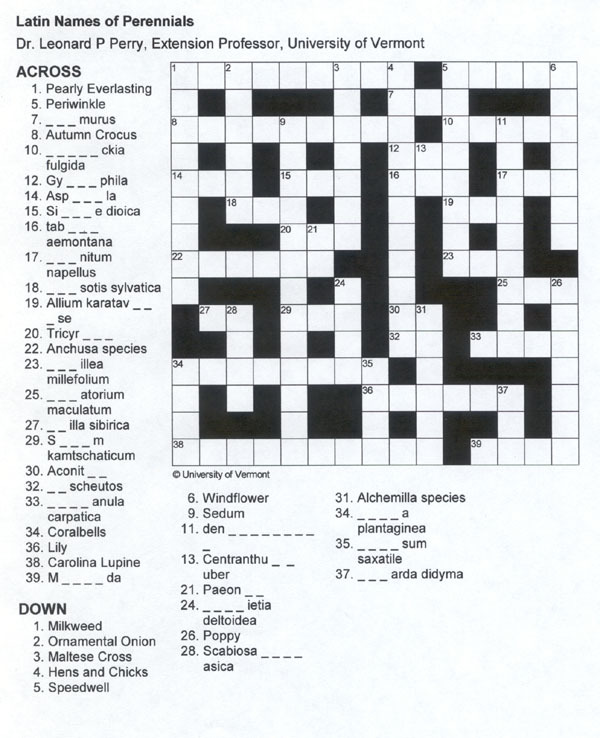 A) some puzzles created with Crossword Weaver can be either printed to fill in with pencil, or played online if links are given. 2.if the puzzle opens and you can play, fine. If not, merely save this .puz puzzle file onto your computer using your brower's buttons or from drop-down menus (look for "Save As"). Then from the Across Lite program installed on your computer, access this file you just saved on your computer and you should be able to play. 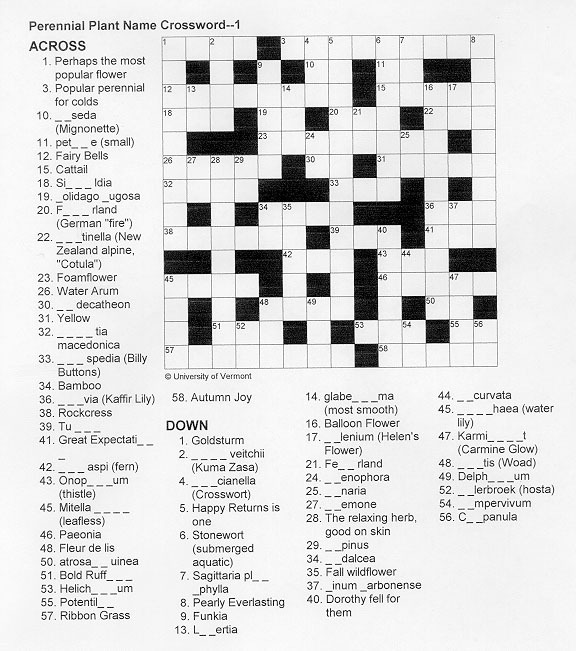 C) if the above doesn't work, OR you don't have time or disk space for software downloads, OR you like the "old-fashioned" way of doing crosswords, go to the photo file of the puzzle if given which you can print out and then play, with pencil! Or you can print the Adobe Acrobat version if you have this software (download Acrobat free). In this familiar word jumble puzzle type, you'll find a grid of letters in which to circle words either horizontal, vertical or diagonal and either forwards or backwards. These you should print out to play. To grow perennials well you must know soils. Test your knowledge here, perhaps learn some new terms. Many plant names, especially species, are terms for color. How well do you know these? This is a real test of your history knowledge. Search for the persons who have had an impact on our history, practices, and plants of horticulture. Articles are linked just in case you need them! Search for the 25 perennial genera. 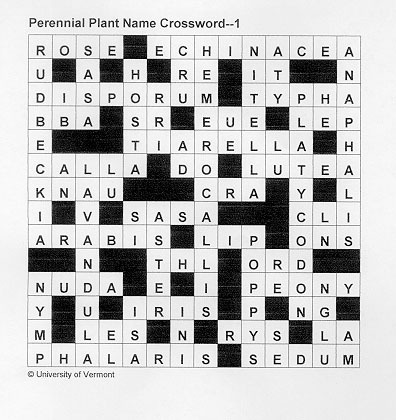 Words relating to perennials, their growth, and culture. A word jumble puzzle as above you can print out and play, created by my daughter Ariannah when 9 years old. Good for the novice gardener as well as for kids. A word jumble puzzle as above, created by mydaughter Ariannah. Words are things you find in a park. Good for the novice gardener as well as for kids. Print and play!